How Much Fish Oil Are You Getting? I know that many of you, like me, take fish oil for your health. From all that I've read it does have a positive effect on all of us. The essential fatty acids in fish oil, known as omega-3s (EPA and DHA), are important for a healthy heart and cardiovascular system, and also plays a critical role in the health of your skin, joints, cell membrane structure, nervous system, and brain development. It's been estimated that individuals with a higher dietary intake of EPA and DHA reduce their risk of heart disease by roughly 47% compared to those individuals who do not eat fish. Adding omega-3s to your diet also helps counteract the excess saturated fat and omega-6 oils found in meats and most vegetable oils. When researchers measured the level of the omega-3 fatty acids EPA and DHA within red blood cells, they found that they had discovered one of the most significant predictors of heart disease called the omega-3 index. This index may be a better predictor of coronary artery disease than other established markers such as total, LDL, or HDL cholesterol; C-reactive protein; and homocysteine. A low omega-3 index score resulted in the least protection and the greatest score resulted in the most protection. The omega-3 index for those individuals with the greatest protection consumed the equivalent of 1,000 mg of EPA and DHA a day. That equals the EPA and DHA found in eating 14 to 28 ounces of fish several times a week, or taking 3 to 4 regular fish oil softgels or 2 concentrated fish oil softgels daily. 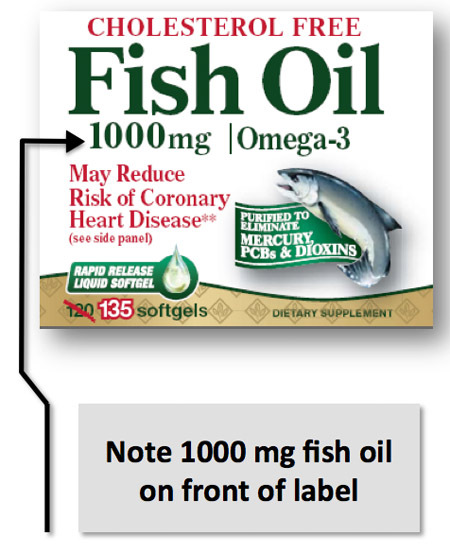 A regular fish oil softgel contains approximately 300 mg of EPA and DHA (180 mg EPA and 120 mg DHA). A concentrated fish oil softgel typically contains 500 to 600 mg of EPA and DHA. Well actually, it can be very confusing. Everyone, including myself, gets mixed up between the amount of FISH OIL and the amount of OMEGA-3 listed on the back of the label. 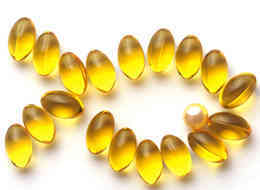 You might think you, for example, are taking 1000 mg of Omega-3 because the front of most bottles say 1000 mg FISH OIL. According to the FDA, this is not deceptive; and it's a very common practice in the fish oil business. It may not be deceptive, but it sure is confusing! Adding up all those individually will give you the total Omega-3 in the capsule. So how many capsules should you take? Many studies say it's important to take 2000 mg of total Omega-3 to achieve noticeable health benefits. 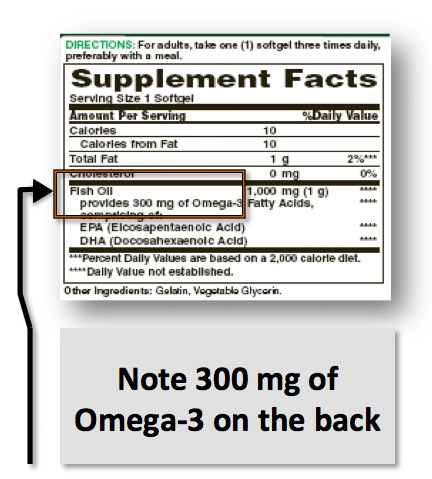 Using the label above as an example, you would have to take about 7 pills to get the 2,000 mg Omega-3 that is recommended for noticeable health benefits. And how many of you are taking 7 pills? None I would wager, I know I'm not. So, no wonder you are not getting the health benefits of Omega-3! So what should you do? Simply find the high fish oil with highest concentration of EPA and DHA that you can afford to buy. So with all this said, simply remember that it is the Omega-3 content you are looking for & it is found on the back of the label. That's what counts. Fish Oil is important to your heatlth, and I hope I helped clear up any confusion you may have had when purchase your capsules. If not please contact me and I'll be happy to help.